The easiest way to write JavaFX 8 applications in Groovy. 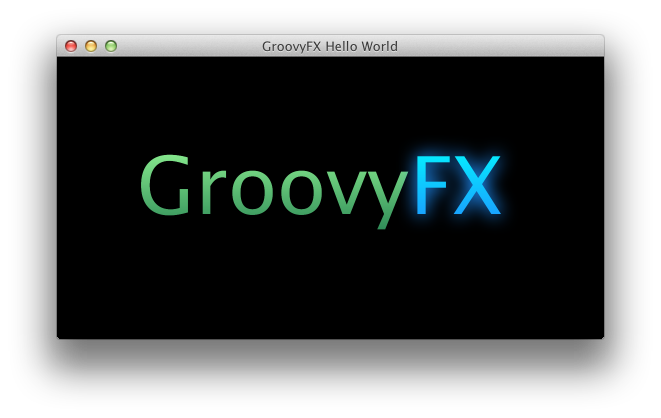 GroovyFX provides a Groovy binding for JavaFX 8. GroovyFX provides the SceneGraphBuilder object, which supports all of the JavaFX controls, shapes, gradients, effects, and animation; as well as other elements of the JavaFX API such as enumerations and colors. Additionally, Groovy closures can be used as event handlers, leading to clean and concise code. A simple and complete "Hello, World" program is shown below. The general pattern for a GroovyFX application is to define the JavaFX components within a Groovy closure that is passed to the static start method of the GroovyFX class. Inside this closure, we simply start declaring our JavaFX scene graph nodes. Each JavaFX class has a corresponding GroovyFX node. For example, the JavaFX Stage class becomes the stage node. All GroovyFX node names are exactly the same as their JavaFX counterparts with the start of their class names converted to lowercase letters. The result of running this program is shown in the image below. See the Getting Started section of the user guide for more information. GroovyFX is licensed under the Apache License, Version 2.0.